Extreame Savings Item! Free Shipping Included! 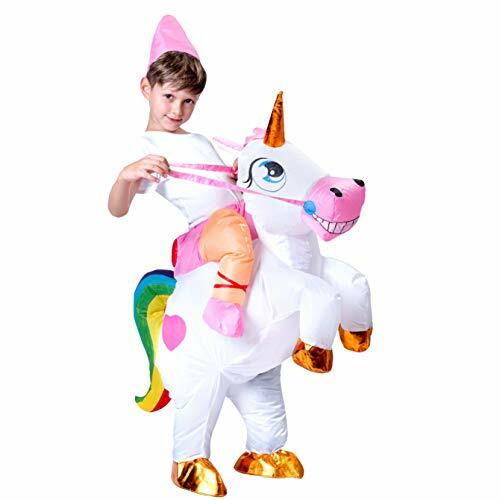 Save 41% on the Spooktacular Creations Inflatable Riding a Unicorn Air Blow-up Deluxe Costume - Child One Size Fits 4-8yr (40''-52'' Height) by Spooktacular Creations at Angelos Hobbies. MPN: 20023. Hurry! Limited time offer. Offer valid only while supplies last. Deluxe Version of Inflatable Unicorn Dress Costume. Child Size. One Size Fits 4-8yr old, 40''-50'' Height. Made with 100% Fire Resistant Polyester. Deluxe Version of Inflatable Unicorn Dress Costume. Child Size. One Size Fits 4-8yr old, 40"-50" Height. Made with 100% Fire Resistant Polyester. Perfect for Halloween Dress-ups, Halloween Costume Party, Halloween Night Event. Use the Pocket Located Inside the Costume's Legs to Safely Store the Battery Pack. DO NOT put Battery Pack in Your Own Pocket Otherwise It Gets Overheated. Adjust the Direction of the Fan and Tighten the Drawstrings for the Best Inflating Performance. Deluxe Version of Inflatable Unicorn Dress Costume. Child Size (4-8 years old, 40"-50" Height). Made with 100% Fire Resistant Polyester. If you have any questions about this product by Spooktacular Creations, contact us by completing and submitting the form below. If you are looking for a specif part number, please include it with your message.